When picking out the right golf outfit for you, there are so many different choices to choose from. Golf outfits range from vests to full summer matching polo outfits. With that in mind, there is a wide variety of different items to mix and match when wearing a quality outfit for the course. In this case, we want to discuss with our audience the top ten best golf jumpers, a quality clothing item that you place over any polo or long sleeve shirt. With that, there is a wide variety of different jumpers to choose from, all offering unique benefits and features. This includes, but not limited to, wind-resistance or rain-resistance. So, for those of you seeking a product like this for your next winter golf game, we have the top ten best here for you. This first brand on our list excels in the area of quality and design. We want to chat about an item from Cutter and Buck. This is the Wind-Barrier and it happens to be made excellently as a fully lined pullover for the golf course. With that in mind, let's see what makes this product so special. This item comes with a lightweight stretch design and lining that is guaranteed to last. The lightweight stretch and comfort allow for individuals to easily be able to wear and the jumper all day long and not at all feel any discomfort. Alongside this, this clothing item is designed to last the test of time and it is tremendously high quality. The material design of this item happens to be a blend of cotton and acrylic. In this, the cotton and acrylic blend make the product extremely comfortable, high quality, and able to withstand the test of time. Overall, the material design allows individuals to be more comfortable when they wear the product for long periods at a time. This product is designed from a brand that is very good at creating quality and value in one simple package. With this, the price of this item is very affordable and overall, it's equivalent to the value. It is wind resistant, breathable, and comfortable, but it is also thick, so individuals may get warm when wearing this product. Durable design and wind resistant. Does not keep you very warm in the winter but will got hot in the spring or summer. As the second jumper, we want to share, it is time to share a brand that excels in the area of quality and dynamic design. 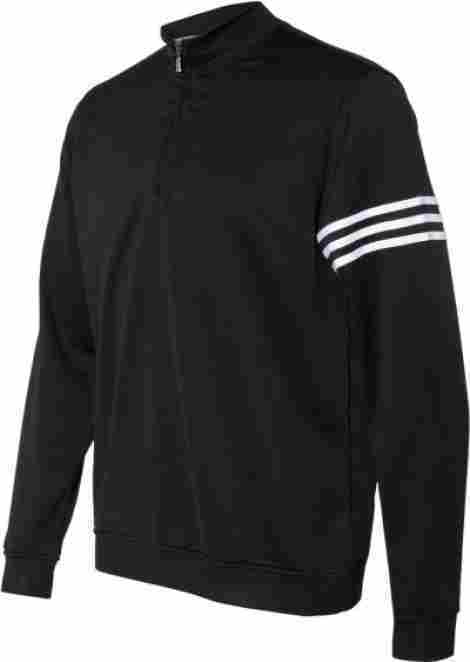 The Adidas Golf Men’s Layering Top is a quality designed product made of 100% polyester and it is highly durable. With that, this product is made to last and the fabric to be well designed and comfortable. The material of this product is 100% polyester and it happens to be quality designed for daily use. This product’s material quality is very comfortable, itch-resistant, snag-resistant and the color design is also resistant towards fading. With this, golfers will note the overall quality to be well designed and the stitching to also be made to last. This product has a large variety of different color choices to choose from. With this, golfers will note the color design to be very high quality. Now, what is most common and unique is the three-stripe design that this brand is known for. Overall, it is a quality design and stitching that ensures days of use and no overstretching or shrinking in the wash.
Let's take a minute and address the price and value. The price of this product to reflect the design and quality. The fabric is also well designed, and this brand is known for their excellent customer service benefits and dynamic designs. Choose between red, blue, or white and individuals will have a great jumper for daily use. It is rare we share two products in a row, but we want to chat about the Adidas Golf ClimaLite with our audience and what golfers can anticipate when it comes to the product's design and quality. This item is a durable and comfortable fabric that is designed very well, and the material is very comfortable. The material design of this product is a 100% polyester blend fabric that is comfortable, itch-resistant, and very soft. Alongside this, the fabric is designed for individuals that want a thin design that they can place over a polo shirt or long sleeve shirt for a bit of extra coverage during the winter or rainy months, which brings is to the next feature. This product is made to be wind and water resistant. In fact, the exterior fabric is made and designed to wick away water and also offer warmth during heavy wind and a bit of cold. With that in mind, the design includes a v-neck collar and set-in sleeves that allow individuals to feel reinforced when using this product. Considering the price and quality, this product is very well designed and guaranteed to last. More so, the material blend is comfortable, and the product to be machine washable, without fear of the item losing quality. With that, it is a durable and great quality product that is designed to last and designed to be affordable. There are also many different color choices to choose from. Set in sleeves for comfort. Not many people have reviewed this item. As the next item on our list, we want to share an affordable jumper that is made by a brand that is trusted and focuses on affordable durability. This product has many features including the fact that it is made with polyester jersey lining and fabric to ensure breathability and durability. Let's talk about Joe’s USA V-Neck Raglan. This product offers full wind protection with elastic half-self fabric cuffs and an overall design that allows for wind to brush by and not affect the individual. Alongside this, the design of this product is made to be water repellent and also offer individuals a true-team oriented design that is comfortable but secure. The design of this product is more of a loose fit design that is very comfortable and is well designed. Alongside this, the design to be oriented towards a regular fit and tall sizes as well, allowing individuals to be comfortable and find a product that will fit very well. Let’s talk about the price! This item is more affordable than another one’s on the list because overall, it is well designed and durable. However, it is designed to be simple and more of a water-repellent clothing item than a stylish item for the golf course. In any case, if it begins to rain, this is the jumper you want to take out. There are also many different color choices to choose from. Plenty of color choices available. Comfortable fit with gussets for better breathability. May run small for very tall individuals. 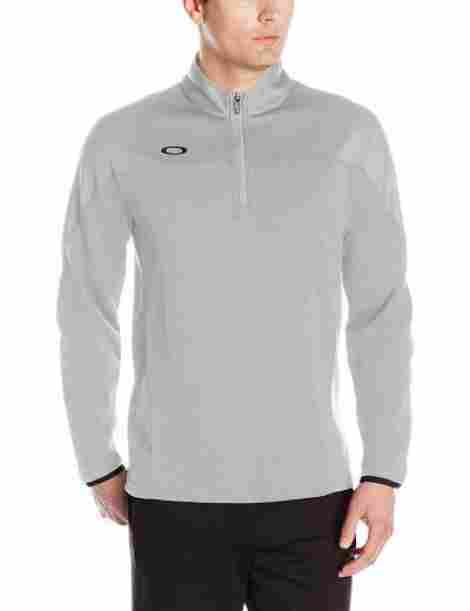 As product number five on our list, we are eager to share the Oakley Gridlock Pullover, a quality product made for individuals that want a comfortable and easy to wear clothing item. With this, we want to share a couple of aspects of what makes this product excellent in its own right. This product has O Hydrolix, which is a moisture-wicking design that allows individuals to be comfortable all day long. This moisture-wicking technology is designed to keep you dry and cool in all weather environments. Therefore, golfers can anticipate being comfortable all day long when wearing this expert product. This product is very comfortable due to the material stitching and composition. The material of this item is made of 98% polyester and 2% cotton for a tad-bit more comfort than others. With this, the comfort of this product to be enhanced by multiple qualities including the fit, the texture, the woven design, the elasticity, and more. Overall, it is an excellent jumper for all day wear and tear. With four color choices to choose from and different sizes, individuals are guaranteed a comfortable product that is also equivalently durable. With that in mind, the price does fluctuate depending on the color chose and size, but it is well worth it. Considering that this brand is known for premium quality materials and design, individuals will enjoy this quality clothing. Made with a regular fit for added comfort. Well-known brand with years of experience. Can be a bit costly. This next jumper is actually made for the ladies. We could not share all men’s jumpers and not introduce a quality product for the women golfers in our audience. We want to share a quality item that ladies will like when it comes to style, quality, and of course, golf durability. In the golf community, everyone shares the same concern when wearing clothing; comfort, durability, and style. So, this is the perfect golf clothing item for spring or fall days on the course. 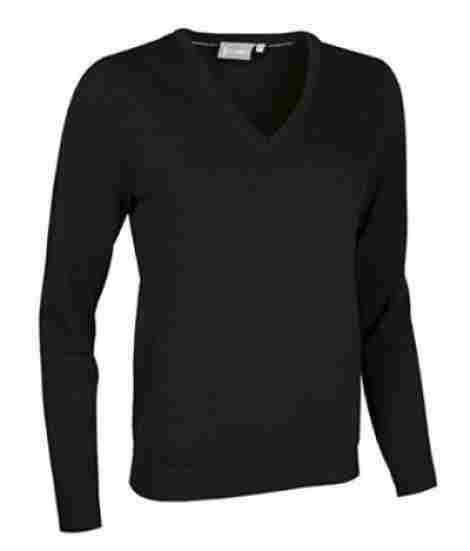 This is the Glenmuir Ladies V-Neck. This product is made of a lightweight and breathable design that allows for an individual to be comfortable all day long, even in more mild and hotter days. In light of this, the breathability is due to a pure combed cotton design that is made for quality but allows for air to pass through different channels of the shirt. This item is made of 100% cotton and golfers can expect it to be very comfortable and well designed for all day wear and tear. The 100% cotton material is durable, machine washable, and will not snag easily. Also, it has a level of elasticity that allows a full stretch comfort and flexibility when wearing the shirt on the course. Considering price and value, this item actually happens to be a bit costly. Considering how beautiful, stylish, and comfortable it is, we do think it is a well-designed product that should be taken into consideration. Furthermore, the lightweight and comfortable design allow for women to be comfortable all day long. With a large variety of colors, this product happens to be very stylish and beautiful. Costly compared to other women pull-overs. As the next item on our list, this product is designed for individuals that want a simple golf jumper that they can put over a comfortable polo or long sleeve shirt. 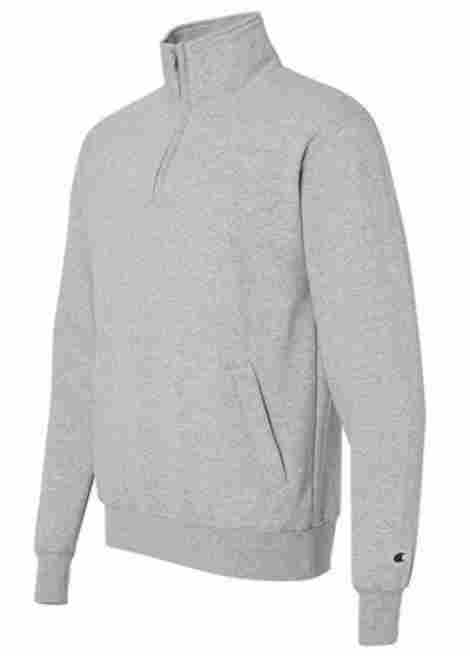 This item is made from a leading brand in the golf community, this is the Nike Core Crew in heather gray. Of course, this brand is touted as a reputable and quality brand. Furthermore, the design of this product only adds to the level of quality professionalism of this leading maker. This item is made of cotton and golfers can expect it to be very comfortable. 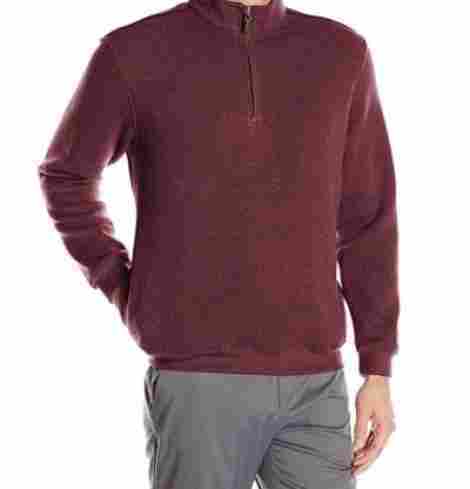 With this, it is perfect for the winter days on the golf course because it adds as a quality sweatshirt that is very comfortable. To add to this, the design to be high quality and executed to be comfortable all day long. Pair it with a white polo underneath and you can look comfortable and sharp on the golf course. This brand is highly trusted in the golf community and they excel when it comes to quality and design. With this, this trusted brand is a leading sportswear maker and their products are known to be durable and last the test of time. Overall, they are highly touted and trusted for their quality and design. This item is priced very well and golfers can expect it to be durable. Now, from time to time it may be unavailable so that its something to consider. Overall, it has five stars and individuals are guaranteed a quality product that is made to last. With that, a big bonus of this item is the relaxed fit still that allows for a full range of movement. Trusted stitching and material quality. Designed to last and be durable. As product number eight on our list, we want to share with our audience a quality brand that excels in the area of design and comfort. 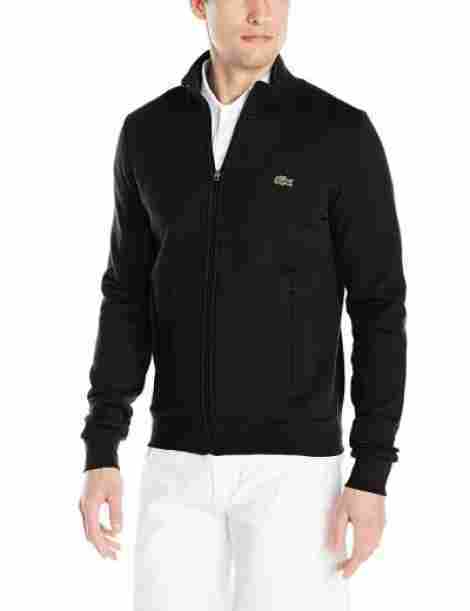 Lacoste has long been known as a premium brand of clothing items. Therefore, of course, we want to share them with you. As the next jumper on our list, the Sports Brushed Fleece is designed for quality, comfort, and golfers can expect it to be impressively designed. The material design of this product is a blend of cotton and polyester. Considering this, the material is 83% cotton and 17% polyester, with the primary focus being on quality and design, with an added essence of durability and quality resistance towards weather environments such as rain and wind. With that, it is designed primarily for individuals that want a quality product for the golf course made by a premium brand. This item has a full zip design alongside side pockets. The zipper is made of a material that is rust resistant and also designed for comfort and ease of use. Alongside this, the pockets have a comfortable lining on the inside that keeps the hands warm and golfers can anticipate being comfortable for long periods at a time with this item. Golfers can expect the design of this product to ensure plenty of value. For the fact that it is made by premium brands, this product to be top of the line. It is offered in two different color choices and the product is a classic fit that contours to the body. Alongside this, the price will vary and it is a bit costly, but that is common for this brand. Quality design and trusted brand. Made from cotton and polyester. Quality zipper design.Seaming details in the front. Durable design and made to last. Few colors to choose from. As the next jumper, we want to share, this brand excels in the area of customer service, quality design, and appealing to the golf community. In fact, they are alone are a massive influence in the golf community. 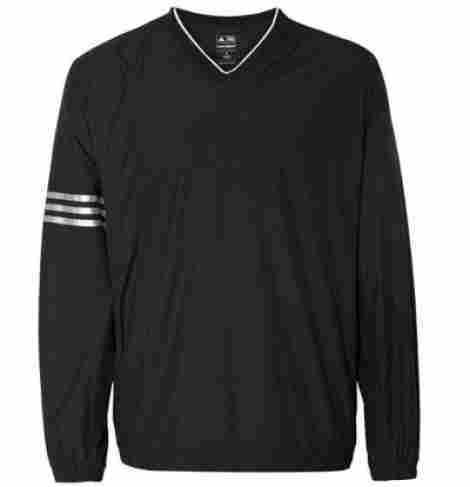 We want to explore the PGA Tour Men’s Long Sleeve Elements Pullover. For those of you new to this brand, they are the apparel version of the PGA brand. With that in mind, Let's explore two fantastic features. This product is made with a cotton blend that includes polyester. The material is designed for quality and golfers can expect the material to withstand the test of time. With that in mind, the value of this product is found in the fact that the material is highly comfortable and well executed. Alongside this, the material is machine washable and golfers can expect it to not snag, fade, or even wrinkle after being washed. This item is a very high-quality jumper. 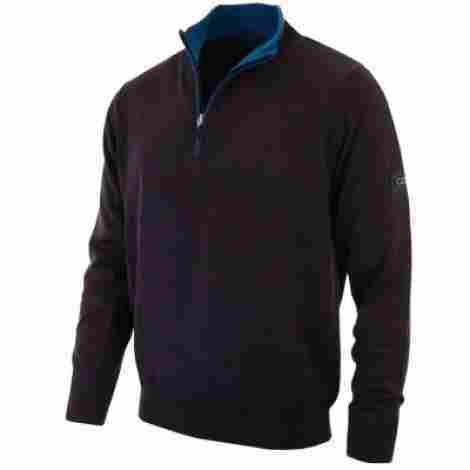 It has a half zip design, it is very comfortable, and golfers can expect the design to be of the best value. It comes in five color choices and individuals are guaranteed premium quality comfort and durability for this item. To add to this, the design is guaranteed to last and golfers can expect the color to look brand new for years to come. To discuss the value and the price tag for this excellent product, we want to share with our audience that it is made of premium value materials and consumers can expect the brand to excel in the area of quality and design. So, for the price, is it worth it? Yes! This item happens to also be very affordable compared to other brands in the industry that create similar products. Quality design and made to be durable. Polyester and cotton are very comfortable. Snag resistant and wrinkle resistant. It is time to explore a quality sportswear brand that excels in the area of designed and value. Individuals will find the Champion S400 to be of incredible quality, alongside a simple design that's great for winter days on the golf course. With this, it comes with various colors to choose from. This item is designed with an athletic fit design. What does that mean? Well, the athletic fit design is guaranteed to be highly comfortable while also contouring to the body. Another benefit of the athletic fit design is the fact that it has set-in armholes and a double-needle stitching to enhance the durability. It also has elastic cuffs that are a bit tighter to ensure warmth during the cold winter months. This product if half polyester made and half cotton made. Containing 50% of both materials, golfers can expect the perfect balance of durability and comfort. With that being said, the materials ensure that individuals can machine wash the product and also wear it for long periods at a time without noticing any wear and tear. To discuss the price and value for this product, we want to share with individuals that this brand is known for their excellent customer satisfaction. To add to this, this product, in particular, happens to be a 4.5-star product and have plenty of positive reviews from individuals. It also comes with different color choices to choose from, and this product is even priced very affordable. Quality value for the price. The shoulders area a bit tight. Feels rough from time to time. So, now that you have gone through our list you can tell the difference between a golf jumper and a sweatshirt or jacket. Although similar, they also have a couple of differences. With that in mind, we want to share with our audience the criteria use during the evaluation process. If you are in the market looking for a quality product that guarantees all-day comfort and durability, we are eager to share this criterion with you. Our criteria act as a specialized set of guidelines that helps us identify which are the most important areas to consider any product. 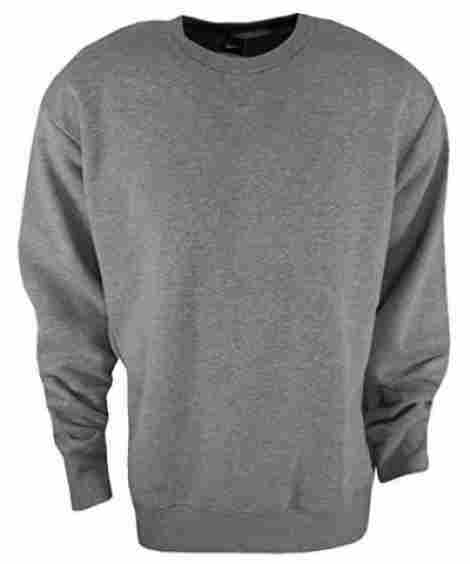 With that, our criteria are formulated for this specific item and although they can be used alongside other products or genres of clothing, we want to chat about specifically choosing a golf jumper. Let’s begin! The material design is a crucial and important element to consider when picking out the top ten best products. The reason being is that we wanted to ensure that there was a wide variety of products, especially when it comes to the material and the benefits of the material. With that, we want to share the most common materials that we encountered when it comes to a jumper. Of course, we would come across this material! Cotton is easily known as the highest quality and most beneficial material in the industry. Cotton is for individuals that want a quality product that is designed to last and be highly durable. More so, cotton ensures warmth, comfort, and is very wear and tear-resistant. However, cotton alone lacks the golf properties that are so important on the course such as moisture-wicking or breathable. This next material ensures comfort but primarily ensures durability and longevity. Polyester is more common than cotton because it allows for the golf product to be more lightweight, durable, easy to wash, and allows room for the benefits of moisture-wicking or breathable to exists. With this, polyester alone is not as soft as cotton, so you may encounter a blend of both. This material is another very high-quality material in the golf community. Spandex is primarily known as a material for work out gear or outfits because of the many benefits. Therefore, it is very common for brands to include spandex in the creation of their products because it allows for masterful features, which we will talk about later. With these three materials in mind, these are the most common. However, other materials of a jumper include lambswool and many more. Overall, the material will affect the durability, features, comfort, and more. So, let’s move forward and talk about the fit and design so we can shed some insight as to which are the most common designs. We have combined these two aspects because they go hand and hand. The fit will determine how well it fits to your body whereas design determines the overall fit. 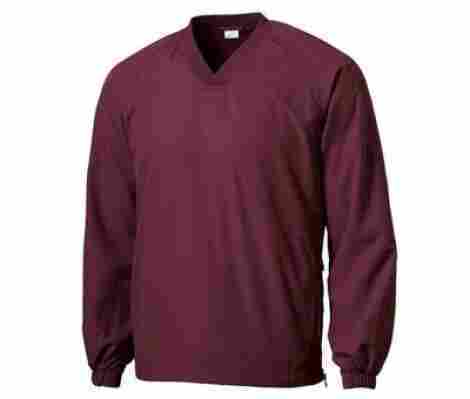 For instance, there are various designs to consider when it comes to a golf jumper and the fit determines whether you will be the most comfortable with that design on. Here are common designs and fits to keep in mind! This type of zip is very common and it happens to be a jumper that only has a small zip at the top part of the neck near the collar that comes down a couple of inches. With that, this item acts more like a sweater than a jacket. A full-zip design has a full top to bottom zipper. This acts more as a jacket and individuals can easily wear it unzippered or take it off easily because of the full zip design. A classic fit is nowhere near as snug as other products and it happens to just be a comfortable and traditional design. This type of fit is for individuals that do not want a loose-fitting product. This type of fit is great for individuals that want a simple product that is designed to contour to the body and be snugger. There are also other types of different fits, such as loose and big and tall. These types of fits are designed for individuals that want a more common loose and comfortable fit. For big and tall men, the clothing item tends to be longer in important areas such as the waist and the sleeves. For these products, the benefits and the features will cause the product to range drastically. A benefit of a jumper is that it is ideal for the winter months. To add to this, individuals can wear specific clothing in the fall or spring. Many of them tend to be designed for the fall or colder weather, not summer. With that in mind, here are the many benefits and features of these products to keep in mind. All of these features and more will range depending on the overall design of the product. With that, we want to share with our audience that it is important to select a product based on your needs and what you find most important. The last thing that we want to talk about is the role of the price tag. Before purchasing any product on our list, we highly advise all consumers & golfers to develop a budget. Reason being, the way this industry is designed is that, if you are not careful, you could find yourself spending hundreds of dollars on a piece of gear. Now, in efforts to save you money, we carefully combed through the market to ensure that, no matter what product we shared, it was the best possible price tag, when comparing the quality and value of the product. Additionaly, do take the time to consider the consumer reviews of the product as well. You see, these consumers are most often golfers, such as yourself. So, they can provide some valuable insight regarding the quality, value, or even whether or not the product is worth the price. Q: Are the pockets inside or outside of the jumper? A: When it comes to pockets, most of them are on the outside. However, depending on the brand they may be fleece lined or even be zippered for added durability and comfort. Q: How do you machine wash a jumper? A: It depends on the material of the product. However, most can be machine washed easily in cold water. Q: What is the best fit for an individual above 6 feet? Q: Is the zipper rain resistant? A: Most zippers are designed to be highly durable and resistant towards wear and tear. However, they are not designed with a rain resistant seam or material.